When attorney Natalie Drummond loses pieces of her memory and starts experiencing hallucinations, no one but B&C Investigations detective Clint Hayes believes the danger she's sensing is real. As cold case reporter Beth St. Regis conducts an investigation into her own past, the secrets she unleashes force her to turn to FBI agent Duke Harper, a man she shares an intimate history with, for protection. Orion Security's leader, Nikki Waters, has always been in charge. But when she becomes a stalker's obsession, she'll need her newest hire, bodyguard Jackson Fields, to keep her safe. 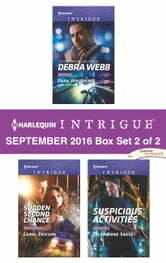 Look for Harlequin Intrigue's September 2016 Box set 1 of 2, filled with even more edge-of-your seat romantic suspense!